My 1972 edition of Strunk & White’s “The Elements of Style.” The blurb on the cover still rings true. It’s been 95 years since William Strunk Jr.’s guide to style was first published by Harcourt. In the years prior to its publication, Professor Strunk circulated his “little book” to English students at Cornell University, one of whom was a budding young author named E.B. White. “The Elements of Style,” a slim, concise guide to writing that lives up to its own rules about clarity and simplicity, has gone through multiple editions and influenced English usage for generations. White would later revise and add to Strunk’s original work for a 1959 edition by Macmillan that became known simply as “Strunk & White.” Since then, there have been other editions, including my own copy that was published in 1972. When I began writing seriously after college, there were four go-to books on my shelf: Webster’s New World Dictionary, Roget’s Thesaurus, Stunk & White and the AP Stylebook. Now all of those are available online, and you can search any number of excellent grammar and usage websites. Still, Strunk & White is what I return to, and I prefer my paperback copy. I’ve taken on a writing project this summer that requires me to produce two to four news items every afternoon. They must be brief and to the point—no more than 250 words each. Most of my writing for clients consists of longer-form articles, white papers or speeches, so brevity has been a welcome change-up. It’s also been a challenge since the deadlines are fixed. To paraphrase Samuel Johnson’s remark about a hanging in the morning, nothing focuses the mind like a deadline! So Strunk & White has come down from the shelf. The rules are timeless, and they remind us of our duty as communicators: to choose words carefully, to use the active voice, to be precise and accurate, to not overwrite or overstate, and to keep ourselves in the background. Here are a few gems from the little book. See if they strike a chord with you. This entry was posted in Communications and tagged E.B. 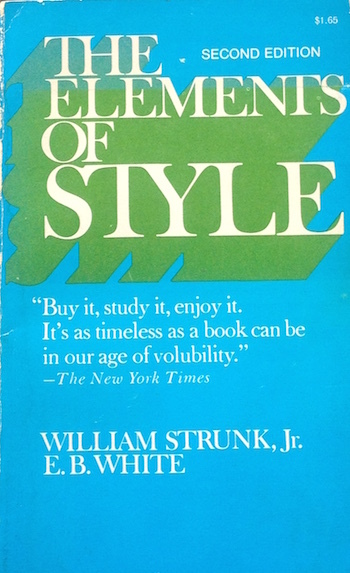 White, grammar, style, The Elements of Style, usage, William Strunk Jr., writing. Bookmark the permalink.